Australian Fur Seal – (Arctocephalus pussilus doriferus) Bull seals return to Seal Rocks for the breeding season after foraging in Bass Strait for ten months. 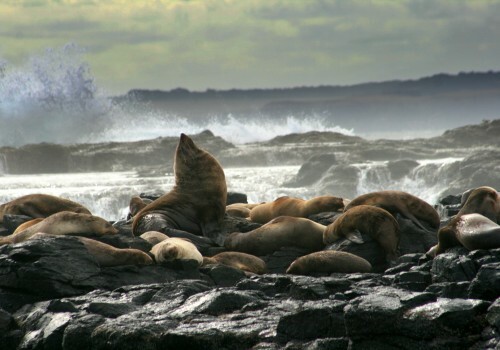 Territorial behavior and fighting amongst mature bulls is a common sight at Seal Rocks; witness the impressive grunting and sheer power of these bulls as they defend their territory, often inflicting wounds to other bulls. Cows (adult female seals) give birth to one pup, pupping season will peak around mid December with up to 4000 pups being born here. 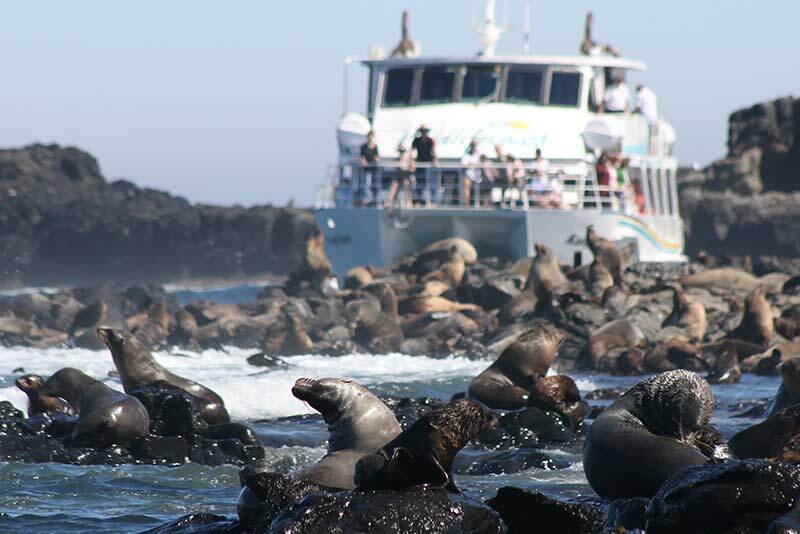 During summer the seal population at Seal Rocks swells to 30,000+ seals! 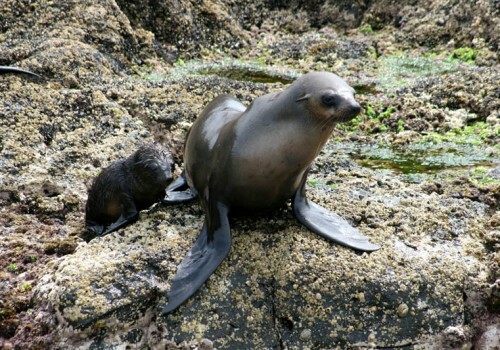 Newborn pups stay on the rocks away from water’s edge and learn to swim in rock pools. Their bleating (lamb-like calls) can be heard loud and clear as the pups call out for their mothers. Within two weeks after giving birth females of breeding age will mate again. A large breeding bull may attract up to 9 cows to become his ‘harem’. Juveniles are now weaned and are fending for themselves, often seen in small pods in the water, practicing their hunting and dive moves, sometimes clearing the water as they leap out of the water! Bottlenose dolphin – (Tursiops australis) grow up to 4m and are grey in color. They swim in smaller mixed-age pods of up to 10, and are often seen along the Phillip Island coastline foraging for food. Often found inshore and near structures such as jetties, mooring buoys and bridges, the Bottlenose dolphins move in a more deliberate manner compared to the acrobatic Common Dolphins, and regularly approach boats out of curiosity. Common dolphin – (Dephinus delphis) Short-beaked Common Dolphins are smaller than the bottlenose dolphins and have a distinct hourglass light grey to yellowish pattern on their side. They usually swim in larger pods than the Bottlenose dolphins and love to ride the bow of the boat. They are highly active and their acrobatic moves are a sight to behold as they ‘surf’ the waves. Feeding behavior is commonly seen off Phillip Island’s southern coastline; witness the tail-slapping technique as they chase and herd the bait fish together. 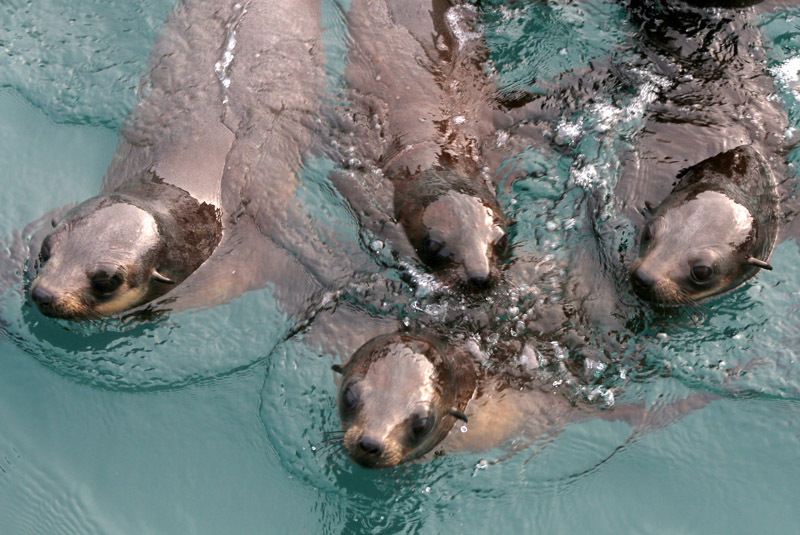 These feeding frenzies often attract Australian Fur Seals, and seabirds such as Australasian Gannets and Crested Terns. Killer whales – (Orcinus orca) Killer Whales occasionally cruise the Phillip Island coast during summer to hunt for seals, and other marine animals and seabirds. These impressive whales are the fastest swimmer of all the cetaceans and can reach speeds of more than 50km/h while hunting. They migrate East in mixed-age pods of up to 10-15 and can sometimes be seen again along this coastline upon their return in autumn. Cruising close to the coast, killer whales can be seen from shore, with identification of individual whales possible through dorsal fin matching. Killer whales are known to hunt cooperatively as a pod, and witnessing a chase is a fascinating experience for every wildlife enthusiast. Australian Fur Seal – (Arctocephalus pussilus doriferus) Seal pups are spending a lot of time swimming, diving and practicing prey-chasing, although still staying in groups for safety. As the pups explore their environment they can be seen to ‘play’ with seaweed, learning to use their teeth to catch and tear prey. The pups’ curiosity to boats is evident as they confidently approach in large pods within meters of the boat! Cows stay away for longer in search of food, often leaving their pups on the rocks for up to 10 days. Moulting begins, and while seals can still go to sea and feed during their moult, but they spend a lot of time resting ashore, grunting and scratching. Pups have their first moult too, changing their distinctive black fur for a brown-silver coat. Mature bulls have now left Seal Rocks and would be found on various haul-outs in Bass Strait and islands along the Victorian coastline. Common dolphin – (Dephinus delphis) Short-beaked Common Dolphins are smaller than the bottlenose dolphins and have a distinct hourglass light grey to yellowish pattern on their side. They usually swim in larger pods than the Bottlenose dolphins and love to ride the bow of the boat. Their acrobatic moves are a sight to behold as they ‘surf’ the waves. Feeding behavior is commonly seen off Phillip Island’s southern coastline; witness the tail-slapping technique as they chase and herd the bait fish together. These feeding frenzies often attract Australian Fur Seals, and seabirds such as Australasian Gannets and Crested Terns. Bottlenose dolphin – (Tursiops australis) Small pods of up to 10 bottlenose dolphins can often be seen in Western Port Bay near Phillip Island’s northern coastline, as they forage for squid n fish. Often found inshore and near structures such as jetties, mooring buoys and bridges, the Bottlenose dolphins move in a more deliberate manner compared to the acrobatic Common Dolphins, and regularly approach boats out of curiosity. Australian Fur Seal – (Arctocephalus pussilus doriferus) Seal pups are weaning off from their mother’s milk and learning to fish for themselves. A seal’s main diet includes small fish such as pilchards and leatherjackets, as well cephalopods (squid, octopus, and cuttlefish). Foraging areas vary greatly between juveniles, cows and bulls, with some bulls going as far as the edge of the continental shelf in search of their prey. Cows and juveniles tend to forage closer to their colony, regularly seen travelling individually or small pods near the Phillip Island coast. Some can even be seen to swim along with dolphins and whales! Common dolphin – (Dephinus delphis) Population size of the Short-beaked Common Dolphin increases during the winter months as more food seems to be available closer to shore. Large pods of up to 40-50 dolphins forage for fish and squid within 500m of Phillip Island’s southern and eastern coastlines, displaying fantastic acrobatic leaps and dives. Humpback Whale – (Megaptera novaeangliae) Winter is the time when Humpback Whales migrate from Antarctica along the Victorian coastline northwards to warmer waters off Queensland for calving. Humpback Whales are dark blue with a white ventral (belly) side and very long flippers. Their name is derived from the way their backs arch when they dive. Humpback whales can be seen along the Phillip Island coast from June to August. Pods of 2-10 of adult and sub-adult whales can be seen travelling within 100m -1000m off the coastline, often displaying fascinating surface activity including tail-slapping, pec-slapping, spy-hopping and breaching. Within the migration season there are approximtaley100-200 whales sighted along the Phillip Island coastline. Curiously the whales can sometimes be seen together with small pods of Common Dolphins and Australian Fur Seals. Southern Right Whale – (Eubalaena australis) Southern Right Whales are smaller but heavier than the Humpback whales. They are nearly black in color and move slower. During June to August small pods of 1-2 can be seen in shallow waters usually within 300m off the Phillip Island coastline as the whales search for safe calving grounds. Southern Right Whales behave differently from Humpback whales as they travel slower and often mill and roll around for hours; witness the spectacular callosities on the whale’s head, the huge 40 ton body and the jet-black fluke (tail) as they dive. Numbers of Southern Right Whales along the Phillip Island coastline are small, usually less than 12 in a season, but their close proximity to the coast offers great shore- and vessel-based viewing. Killer Whale – (Orcinus orca) During the winter season Killer Whales can sometimes be seen along the Phillip Island coast as they follow the larger whale species during the northerly migration. Small mixed pods of adults and subadult whales can be seen travelling close to shore; witness the distinct black and white patterns and the imposing tall dorsal fin as they surface to breath. 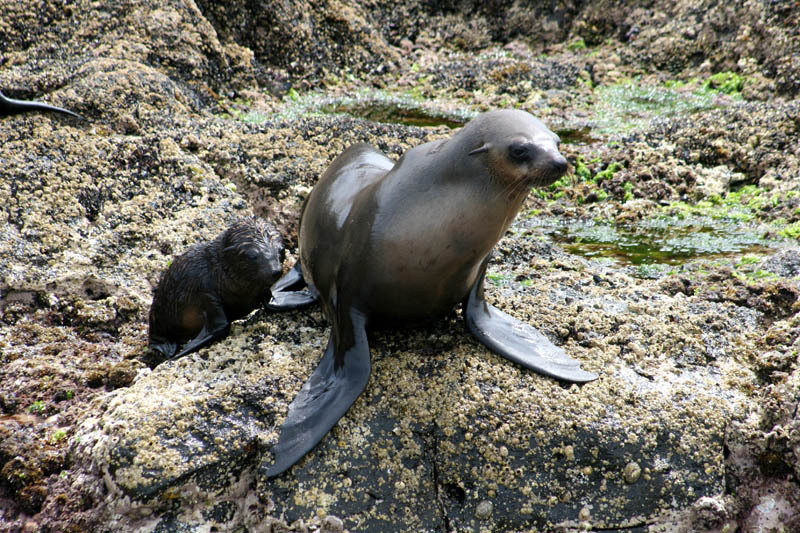 Australian Fur Seal – Bull (male) seals start arriving and claiming territory, causing audible and sometimes violent fights between competing males. After they have claimed their territory they will herd females into their area for breeding. Females go on longer foraging trips as their pups are not dependent on them, and they have to become strong before giving birth. Common & Bottlenose dolphin – Spring season is the time you would see an increased number of calves amongst the dolphin pods. Witness the dolphins acrobatic moves as they approach and bow ride the boat, and on calm days you can even hear their clicking sounds from above the surface of the water. Humpback Whale – (Megaptera novaeangliae) At the end of the migration season humpback whales leave their breeding grounds off the Australian East coast and migrate southwards to Antarctica. On this journey the whales can be seen travelling along the Wilsons Prom and Phillip Island coastline in small pods, often cow (female) and calf travelling together. 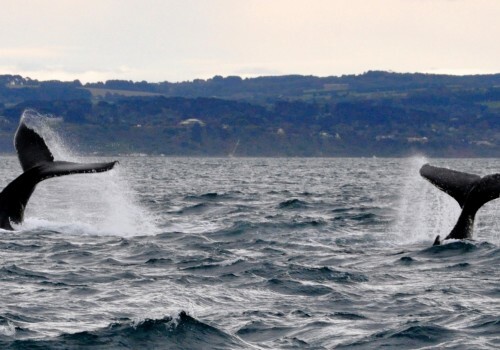 Many whales often display fascinating behaviours such as breaching, tail- and pec-slapping, believed to be an important communication and socializing tool. Some whales can even be seen to feed amongst bait fish, often accompanied by Common Dolphins and Australian Fur Seals, as well as seabirds including Australasian Gannets and Crested Terns.